The color blue, it can mean many things. Make it flash and throw it into the DJ or club world, and it could mean you just got pulled over for being bad. Now take blue, throw in the flash then turn it into a laser and you have one bad (as in good) blue laser. On the DJzone bench today, we have the American DJ Micro Royal Galaxian, a portable mini blue and red laser. This affordable little light is housed in an aluminum case a little smaller than most external harddrives and it weighs only about a pound. Our initial tests of the American DJ Micro Royal Galaxian took place in our 22’x50’ warehouse. Placing it in one corner of the room with a small amount of haze, it filled the space with eerie blue beams of light like those you see in a sci-fi movie. For good measure, American DJ added in a red laser for variety, but it’s the blue one that has the coolness factor. Pumping in some club sounds made the room come to life with beams popping and moving to the beat. The small red and blue firework-like beams bursting on the walls and floor packed quite a punch. The only cord attached to the American DJ Micro Royal Galaxian is the power cord. The controller is wireless and not infrared. Not being infrared means you can be almost anywhere in the room and set the Micro Royal Galaxian to sound activation, automatic, blue, red, blue and red or blackout. 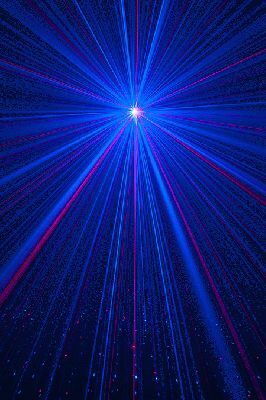 Up until just a few months ago, the technology to manufacture a compact blue laser like the American DJ Micro Royal Galaxian did not exist. American DJ is always on the lookout for new, innovative and limited price point lighting solutions for their customers. 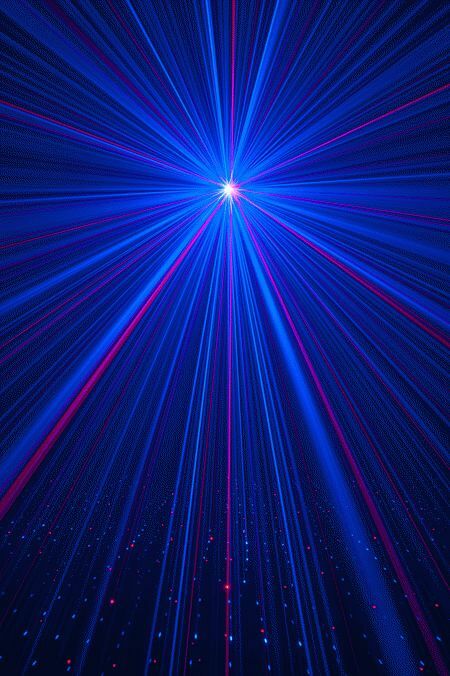 For DJs performing in small to mid-size venues looking for an affordable blue laser to add to their show, the American DJ Micro Royal Galaxian will give them exactly what they are looking for.